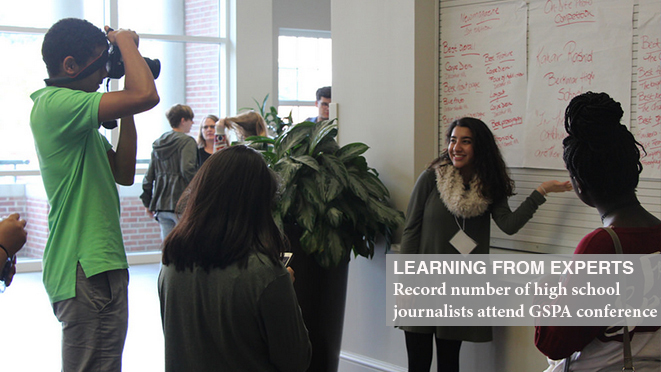 Sophie Fernandes, a senior at Clarke Central High School in Athens, Georgia, has been named the Georgia Champion Journalist by the Georgia Scholastic Press Association and the Journalism Education Association. Ellie Ritter of Decatur High School is the Georgia Champion Journalist runner-up. The Georgia Champion Journalist Award recognizes the top high school senior journalist in the state. Fernandes has been involved in Clarke Central High School’s Odyssey Newsmagazine since 2014. She has served in a variety of capacities including managing editor, photography editor, visuals staff member and viewpoints writer. She is a member of the National Honors Society and has received a number of awards for her photography and writing, including the Georgia Scholastic Press Association’s Junior Champion Journalist presented last year. The Georgia Champion Journalist runner-up, Ritter, has been involved with Decatur High School’s news magazine Carpe Diem since 2013. She has served as design editor, copy editor and writer. Ritter is a member of the National Honor Society and is involved with mock trial, student government, marching band and varsity golf. In 2015, she was selected as a participant for the Governor’s Honors Program for English/Communicative Arts, a program that selects the top 1% of students in the state. Fernandes will compete against the other state winners in the national level. Winners will be announced at the JEA/NSPA convention’s concluding awards in Seattle, Washington. GSPA received five top-notch submissions for the coveted award for the 2017 competition. Fernandes and Ritter will be recognized during the GSPA Workshop and Awards event on April 24, 2017.